You're there. You hear words, or perhaps just see someone close in on a friend or associate, and it doesn't look good. It is a confrontation at best, maybe even an attack. You want to help, but what to do? You also begin thinking that someone might get hurt, and that someone might be you. You could hit or attack the attacker from the rear, but then you might be the center of your own counter attack -- finding yourself in a hospital or with new dental bills you hadn't accounted for. You might also hurt the would-be attacker and suddenly be answering to some man in a blue suit with a badge -- trying to explain why you hit someone from behind without provocation. Yeah, I know, he started it, but not with you. Even worse, probably no one else recognized the initial attack or confrontation for what it was. Can you spell hot water, handcuffs, a free ride in a police car, a visit to a judge, with a fine at best and a new criminal record to be proud of? 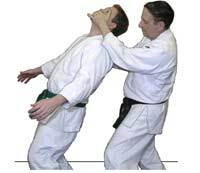 So here is one simple method of handling the situation simply and without injury - a little jujutsu. A very large attacker is physically abusing your friend (small female or male.) You approach the attacker from the rear. 1. 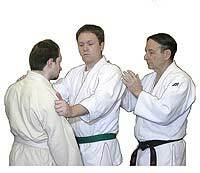 Approach the attacker from the rear and use a helping hands technique. 2. Place your left hand under his nose and pull his nose backward until the attacker’s neck is locked. The area pressed against is a sensitive pressure point where your upper lip meets the start of your nose. 3. 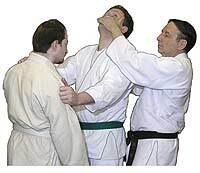 Put your right hand on the rear of the attacker’s neck (his spine is locked), and drag him backwards (away from the defender). If the attacker gives you an indication that he is going to hurt you, then drop him to the ground. Then call or have someone else call 911. OK, I know. Here you might have a question: can the person whom you are pulling backward twist out of this technique? One of my students asked the same question. I put him in this lock, and he is compact and very powerful -- five foot eight inches and 265 pounds. He tried to twist out of this hold and couldn't. He was surprised. The reason is that you are locking in the other person's neck and back joints with your right hand and he is also off balance. Acknowledgement: I want to thank Christopher Caile, Editor of FightingArts.com for editing and adding commentary to this article.